Benefit from Omega-3s in Omega Concepts 780 EC. 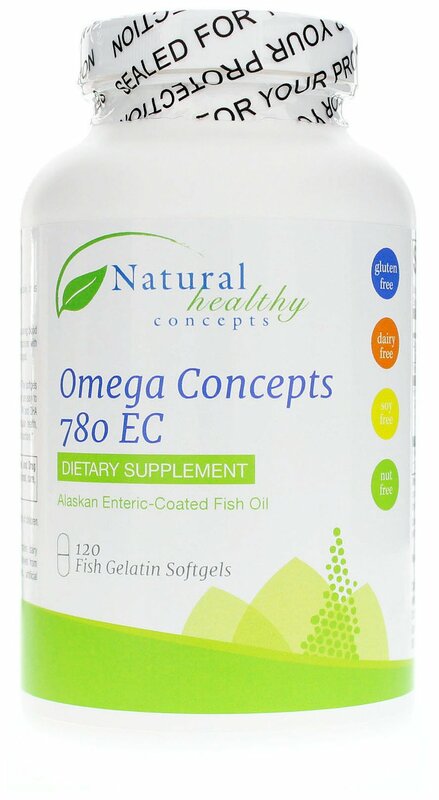 Omega Concepts 780 EC from Natural Healthy Concepts is a dietary omega-3 supplement that may support heart health and brain function in easily digestible softgels made from certified, sustainable sources of fish that are naturally high in protein and low in fat. Omega-3 fatty acids are an essential part of your health. While your body can’t make these healthy fats on its own, you can supplement them in your diet. This softgel supplement contains sources of Alaskan Pollock, a mild-flavored fish that is considered one of the top five seafood species consumed in the U.S., as well as Pacific whiting and tilapia. Free of any artificial additives, sweeteners or common allergens such as wheat, soy, dairy or nuts, this supplement offers long-chain omega-3 fatty acids that may support overall health and wellness. They are covered with a GRAS-certified enteric coating for optimal digestion and absorption. Omega Concepts 780 EC Product Details. Contains certified sustainable seafood sources. May support cardiovascular health. May support cognitive function. May support joint health. May support nervous system function. Non-GMO. Manufactured in a GMP Compliant facility. Supplement your diet with an omega-3 fish oil to cover potential gaps in nutrition and give your body what it needs to stay healthy. Order Omega Concepts 780 EC from Natural Healthy Concepts today! Other Ingredients Other Ingredients: Softgel (tilapia fish gelatin, vegetable glycerin, and purified water), GRAS enteric coating (purified water, ethylcellulose, sodium arginate, ammonium hydroxide, medium-chain-triglycerides, oleic acid and vegetable stearic acid), and mixed natural tocopherols. Contains Fish (Alaska Pollock, Pacific whiting [sources of fish oil], tilapia [source of fish gelatin]) from certified sustainable sources. Serving Directions Adults: Take 1 to 2 softgels, 1 to 3 times daily or as directed by a healthcare professional. FDA Disclaimer Statement These statements have not been evaluated by the Food and Drug Administration. This product is not intended to diagnose, treat cure or prevent any disease. Precautions Warning: Avoid if allergic to any ingredient(s). Individuals taking blood thinners or other medication should discuss potential interactions with their healthcare practitioner. If you are pregnant or nursing, please consult your healthcare professional before using this product. Keep out of the reach of children.